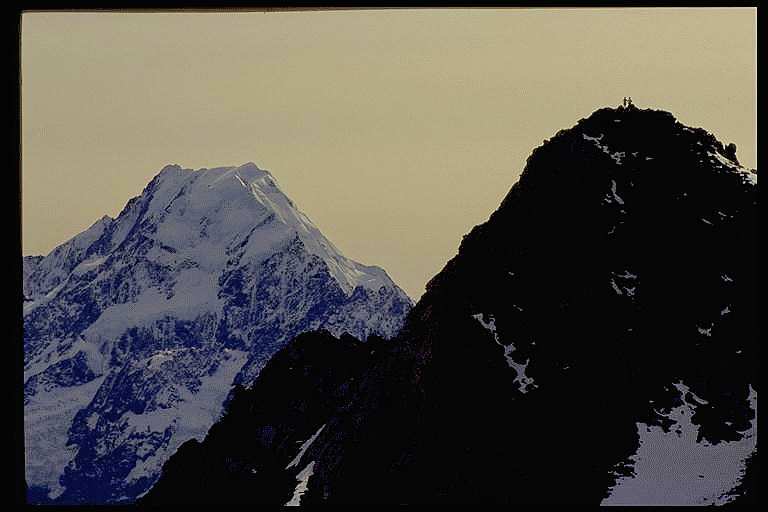 Climbers on the summit of Mt Annette, taken from the Annette plateau on the Sealy range. Mt Cook looms behind... some 1500m higher. This photo was taken on a CUTC (Canterbury University Tramping Club) trip in the first term. Some spectacular vantage points can be achieved by those with little experience... provided the weather is good. On this particular weekend, when some 50 or so CUTC members invaded the park, the weather was magnificent and some of us camped on the ridge beneath Mt Annette, high above Mt Cook village. Not a breath of wind - even our candles stayed alight! A rare night beneath the stars.